Mixing is a randomization process that attempts to get all ingredients into a direct mathematical ratio to each other. The results can be measured in several ways (see our Consumer’s Guide). When it is possible, several samples are compared for variance among the samples. A Standard Deviation and Coefficient or Variation (Cv.) is calculated using standard statistical formulae. A Cv. of 5% is the measurement from the mean and considered nearly perfect. Segregation is the main enemy against high performance mixing. Studies show that in particles over 50 micron, a size differential of 20% will create a roll apart effect. Particle size cannot be controlled this closely, so it is the number one enemy. Particle weight can be a problem in smaller particles, or when the weight exceeds the mixer’s capability. Over 300 lb. per cu. ft. or Specific Gravity of 5 in our mixer is the point where that may occur. The speed of mixing is a major factor to overcome segregation while mixing because the mixing is faster than the segregation factors can react, and necessary to get an accurate mixture. Other factors for difficult mixing are sifting, electrostatic charge, sticky ingredients or lumps.. 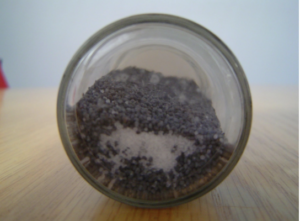 The sample size has to be big enough to mathematically contain the ingredient having the smallest number of particles. It also has to be big enough that the smallest ingredient can be analyzed. It should not be bigger than the size it will be used in. For example, if you are to use one cup of detergent, the sample should be no bigger than the cup. We don’t believe you should use big samples, cut and grind, until you get something small and then test it. Grinding is also mixing so the result is not the mixer’s capability, but the mixer and grinders capability..
Sampling always is inaccurate. Scooping off the top is usually as good as any method. Sampling correction factors are being used and it makes numbers look good. I don’t know the real value. What is high performance mixing? Mixing free flowing materials to Cv. 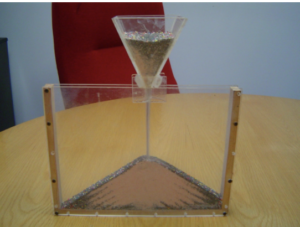 5% in 10 to 60 seconds in small samples, and having solutions to offer when the ingredients are not free flowing. The speed of mixing (not the rotor) overcomes the forces of segregation and overcomes different sizes and weights of particles. Ability to predict, repeat, and reliably deliver results. Mixing without degradation or heat generation. Offer savings in minor ingredients. Having shear when it is needed. High quality machines rated to work 99.8% of the time. High volume production from the same or less building space. Machines that offer more profits for the user and good return on investment. The cost per ton is invariably less with High Performance mixers. Fast, accurate, high performance mixing requires organized transport, and void space for particles to randomly change place with no dead spots. Our patented invention is a rotor that is a paddle system containing at least 12 paddles turning at slow speed of 300 feet per minute (1.5 meters per second) on the periphery. Half the paddles will be directing the material flow toward one end, and half will be directing to the opposite end providing transport. The paddles mechanically create voids and then direct material to randomly fill the voids. The system is completely balanced so all particles are within reach of the rotor. You can load anywhere. All mixers have a different size of paddles so they all mix the same. 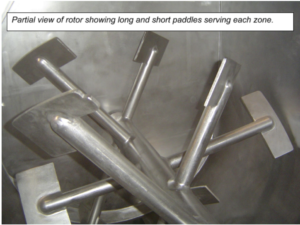 The zone serviced by two paddles is never more than 10” (250 mm) to reduce segregation. The number of paddles is not limited. All particles are in motion with no dead spots. The void creation for a size of mixer is taken from a graph created empirically and varies from 1.8 to .67 times the volume of the batch size per revolution of the rotor. There is tremendous particle movement so particles have many opportunities to change place. . The particle movement makes the rotor ideal for adding liquids and marriage with Shearmakers.